I have a confession to make. I have lost the card from my sewing secret Santa and can not remember the name on the card but I do love Ginger thank you! Please comment so I can thank you properly. I have Sharon’s card from creativityandfamily and I loved all my presents, especially the lovely bag with added stitch counting charms and the vintage buttons. Here are a few photos of my lovely group of goodies from my sewing and knitting secret Santas. 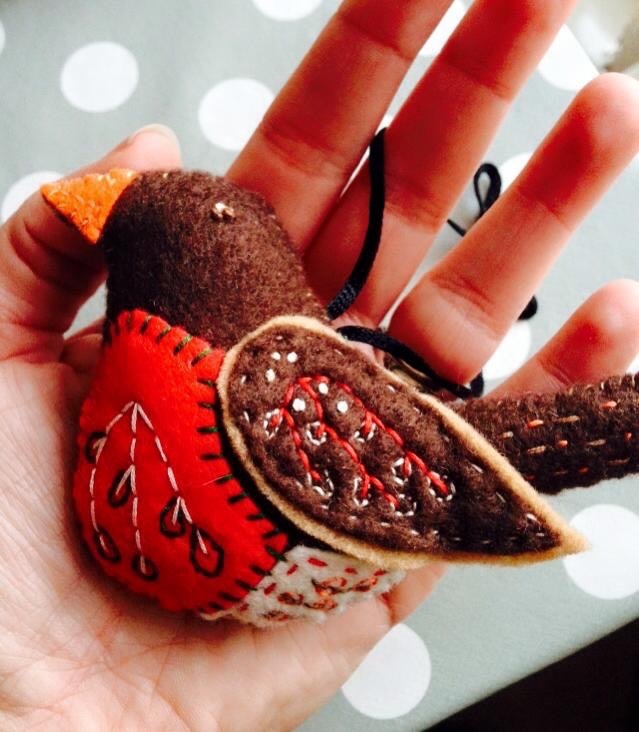 The lovely hand made ornaments from Sharon were on my tree and are now packed away for next year. I have material on order for the Ginger skirt. I love making skirts and need to wear more so I can keep making them! I love the pointed centre version and have some lovely dark purple corduroy on the way. My first new dress making project of the year. The lovely grey wool is possibly going into a stormy sky for and a freestyle embroidery idea I have. This will have to wait as I already have a sunflower to make. I love felt and it’s one of my favourite fabrics to use, so will definitely come in handy. I will crochet and try beyond a rectangle this year and the counter charms will help as I am forever losing count and am quiet hopeless at counting the stitches for knitting or crochet. It’s probably why I prefer embroidery and sewing. Count over ten and I start to lose track!!! There was also a poppy red scarf, a notebook and a lovely crochet book in my gorgeous gifts. It really was a lovely project to take part in and I would recommend taking part next time. Thanks again Sheila for organising everything. It was meeeeeeeeeeeeeeeee!!! Glad you liked it! I really hoped you hadn’t delved into Colette patterns yet! Thank you Hannah and I apologise again for losing your card. I remember my son and I reading it and saying how did she know I liked Ginger and then of course it made sense. Some lovely purple corduroy arrived today ready to make my first Collette pattern Ginger skirt. Just need a zip and have decided on the pointed top version as it reminds me of Kate Winslets skirt in “Finding Neverland”, which we watched over Christmas. The scarf is very tactile and I am very impressed you made it. I am going to take the notebook with me to my first Embroiders Guild meeting on Saturday and haven’t decided on what to make with the felt yet. Thanks again for such lovely gifts.